Born in Cali, Colombia, ​Ana Echeverri came to the United States with her mother in 1987. As a child she knew she had a very acute sixth sense, but it wasn't until her husband was diagnosed with a rare form of terminal leukemia, that her abilities began to increase, to the point that she can feel entities, can channel them, and he has a very particular perception in her hands, she is like a scanner. She works in her own embroidery business where she sometimes has medium experiences with her customers and she gives them messages. Due to how unique and challenging of her situation Ana decided to contact PRISM founder David Pierce Rodriguez so she could test herself, and understand her gift more by participating in the investigations. Ana has been part of investigations done in Villa Paula, and the Deering State, she has appeared on Hispanic TV channels such as Mira TV, America TeVe, Telemundo and Mega TV. She has been with PRISM South Florida for the last two years and she is one of their mediums. 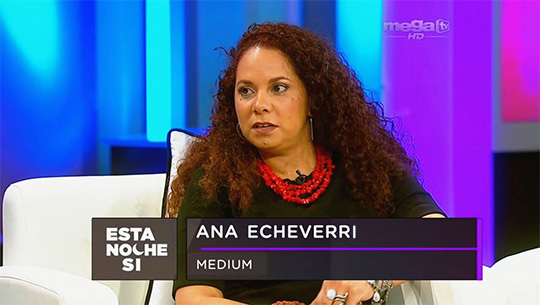 Ana Echeverri emigro a los Estados Unidos con su madre de Cali, Colombia en 1987.Desde nina supo que tenia un agudo sexton sentido, pero no fue hasta que hace 6 anos cuando su esposo fue diagnosticado con una leukemia terminal, que sus capacidades comenzaron a acentuarse. A tal punto que puede sentir entidades, canalizarlas y tiene una percepcion energetica muy singular en sus manos. Como si fuse un scanner. Ella trabaja en su propio negocio de bordados, donde a veces tiene experiencias mediumnicas y canaliza mensajes para sus clientes. Debido a lo impactante que era su situacion, decidio contactar a David Pierce Rodriguez y asi entender y poner a prueba su don en las investigaciones. Ana hace parte del Capitulo de PRISM South Florida.